Yet again I've been doing other things besides blogging. This time it was driving (by myself) from Illinois back home to Idaho, getting ready for houseguests, spending an enjoyable time with said houseguests, and fighting more with my internet at home, which is extra frustrating having so recently spent time at my mother-in-law's, where she gets literally six times faster download speed than we do on a good day (and most days are not good internet days for us, unfortunately). I'm typing this post at what I've come to think of as "my desk" at the library in town; I get a bit miffed if someone is sitting here when I show up (I don't say anything or do anything because I am not so far gone that I think I have any right to this particular space). I've still got a backlog of nails of the day photos, so I'm going to whittle away that that today and keep my fingers crossed that my internet will be back up semi-reliably soon (I did see a utility truck heading up the mountain as I was heading down, so maybe that was a sign). Other than the "proper" manicures I did for IEC, my nails have been adorned for months now with various strips and fakes, none of which I put on when I had easy access to my lightbox, so the lighting in the following photos will vary tremendously. Consistency is not my middle name. I put on these Sally Hansen Salon Effects in Pink Pong when my nails were in a short and fragile state that I didn't particulary want to call attention to; this shade has become one of my go tos for situations like this. They're especially nice because I have matching polish from the Complete Salon Manicure line that I can easily touch up with when I start to get tip wear. Speaking of strips, I was walking across the main parking lot at the resort and spied this on the ground, the peel off back of a nail polish strip. I swear it wasn't mine. I wish I knew whose it was; I might have a new friend close by that I just haven't met yet. I can take neutral for only so long, which led me to add a glittery jelly topcoat over the Pink Pong strips. I didn't take a photo of the bottle and can't find my notes, so just what this rosy topper is will have to remain a mystery at least for a while. When those strips came off, Sally Hansen Salon Effects in Love Letter went on. I liked these so much that when I took them off due to tipwear and nail growth, I used the second half of the box and put the same design right back on. I somehow managed to rip the end off of of the strips and had to patch it, then added Sally Hansen Diamond Flash top coat to seal it. The repair didn't look as obvious in realy life as it does in this photo below. Next up were Incoco Nail Polish Appliques in Emerald Isle, a very subtle St. Patrick's Day design in gold and green. I counted on most people not paying that close attention when I wore these well after the holiday for which they were intended. I'll finish up this installment of "a not very brief history of what was on my nails" with these China Glaze Real Nail Polish Appliques in Beyond Baroque. As I noted when I reviewed them in 2013, these are thicker and shinier than other nail polish strips like Sally Hansen. I tried to position my hand so as to minimize the wrinkles I got in some spots due to fighting with the thickness. They looked okay but aren't my favorite to work with. I'll still try and use up the ones I have in my stash, though. Waste not, and all that. As promised, today I've got the goodies I got at Indie Expo Canada. I am traveling with my lightbox (that's not strange at all, right? ), so was able to take proper bottle shots of everything eventually, but first here's a quickie pic of all the VIP goodies on my hotel bed just after I'd unwrapped and sorted everything out. Polish, of course, but also a stamping plate, nail decals, emery board, soap, eyeshadow, a bath cupcake, and skin/hair serum. Well worth the price of the ticket, for sure. I couldn't wait until after I set up the lightbox to try some of the bath products I got from SoGa, so they didn't get the glamour shot treatment. These bath snowballs looked so pretty; it was hard to pick just a few. 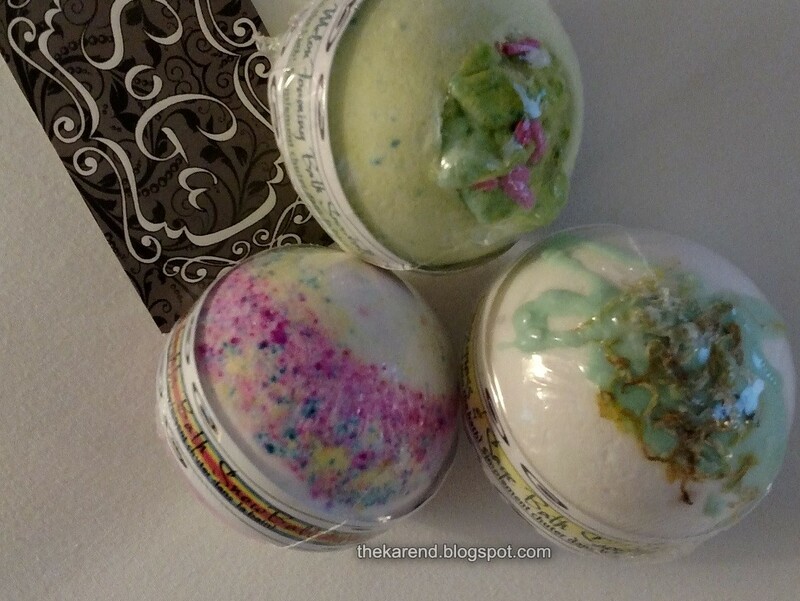 I got Northern Lights, Cucumber Melon, and Lemongrass & Sage. 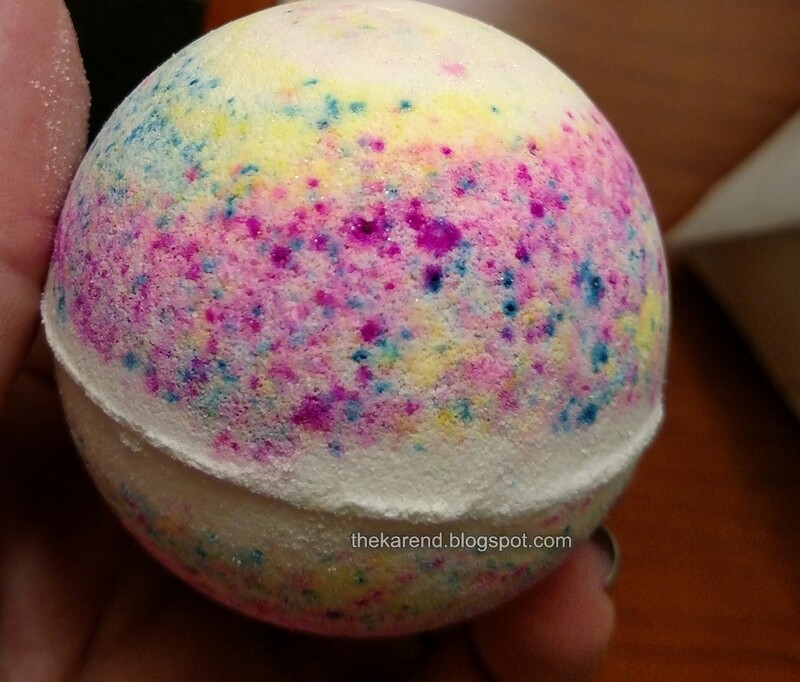 I used Northern Lights first and almost hated to toss it in the bathwater and see those gorgeous colors fizz away. I'm glad I did though, as it smelled great, sort of fruity and floral and woodsy at the same time, not overpowering but strong enough to linger on my skin for a while after I dried off. I shared my creations from the pre-con polish making workshop in my other IEC post, but here they are again just for the sake of completeness. I love that Pam had special IEC labels for the fronts of our bottles and also made custom name stickers for the bottoms once we'd decided what to call them. Mine are Lost in the Forest, Flair Purple, and Bonus Flakes. And now on to all the nail stuff I bought—please keep in mind I've been on a very low buy for quite a while now, so these were the first indies I'd gotten in well over a year, so I had some serious pent up demand. Girly Bits—on top are Ultra Holochrome Powder and SFX Nail Powder in Alchemy; bottles are Brick House, Stayin' Alive, Le Freak, Refresh! Refresh! Refresh!, Sugar Beach, and Lost in the PATH. Beyond the Nail—Holo Blue Microglitter, Fiddlesticks!, 416/905 (IEC exclusive), Tee Dot (IEC exclusive), and Space Cadet. This is a new brand for me. Great Lakes Lacquer (also a new brand for me)—The Jewel of Ontario and Indie-cent Exposure (IEC exclusive); Native War Paints—Picnic in Trinity Bellwoods, Meet Me at Union Station, and Scaling the CN Tower, along with a mini of cuticle oil in Birthday Cake. Alter Ego (yet another new brand for me)—Olympic Contender, B Informed, Precious Heart (IEC exclusive), Silver Cocktail, and Courtney's Frogspawn Coral (coral as in coral reef, not the color). Fair Maiden (again, new brand for me)—Twilight, Cruel Summer, Northern Exposure (IEC exclusive), Moonstone. Pahlish (not new to me, of course) Graffiti Alley (IEC exclusive) and Fiendish Fancies (new to me) I Want My Cake!, Lycanthrope, and I Can Feel Myself Rotting. Moo Moo's Signatures (yep, new to me)—Cowgirl's Broken Time Machine, Yeti-Moo, The Last Ninja, and Mission Impossible in Toronto (IEC exclusive). Ever After Lucy in the Sky with Diamonds and License to Lacquer, Colors by Llarowe Can We Have Trudeau?, Hit the Bottle Midnight Pumpkin, Electric Indigo, and Peacock Shimmer. Ever After and Hit the Bottle are new brands for me. Whew. And there were a couple brands I didn't buy from but wanted to. Next time maybe I should try the approach of studying the shopping guides ahead of time and making a list and trying to stick to that. It's not really my style but it might help with the feeling of overwhelm that set in at a certain point. I couldn't try everthing right away, of course, but did sample a few things. 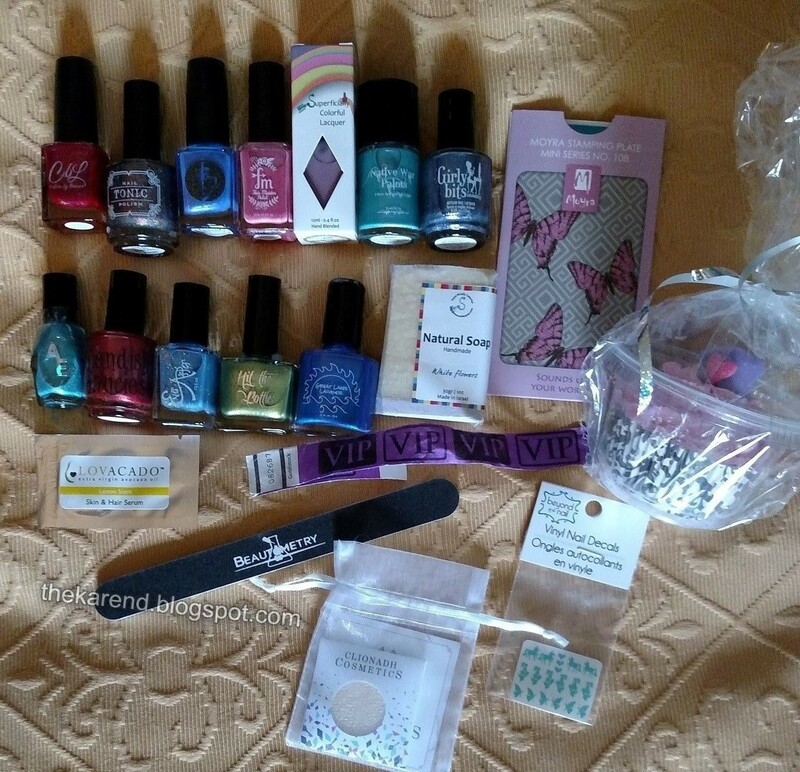 I started with two of the Hit the Bottle stamping polishes, grabbing a Salon Express plate from the box of stamping supplies I brought with me from Idaho (like the lightbox, totally normal thing to take on a road trip). When it came time to start swatching, I chose the brightest of the lot, Fair Maiden Cruel Summer (thank for the earworm, FM). It's an orange-y coral with pink shimmer. I used three coats on my nail. The shimmer is subtle but gives depth to the color. It's so bright I thought it might dry satin like a neon, but it didn't; my swatch is without topcoat. This is a great summer color for sure. Next I sampled Fiendish Fancies Red Herring, because I had to know if my instinct that this would look good on me that led to me swapping away the warmer toned Harlot was correct. I think it was. I did three coats of this red shimmer, though a bit more care in application (yes, I was rushing again) would probably have made it fine with two coats. Finally, I had to swatch some Girly Bits, as without Pam there would have been no IEC. I did two coats of Lost in the PATH, then added one coat of Refresh! Refresh! Refresh! on my ring finger for a subtle accent. Lost in the PATH is a purple shimmer; Refresh! Refresh! Refresh! has blue to green shifting flakies in a transluscent base. Lost in the PATH is just the sort of polish I associate with Girly Bits; it looks equally good in indirect light (above) as in direct light (below). I'm happy with what I got at IEC, definitely. I didn't get every exclusive and limited edition I saw, so feel good about having some restraint. Almost all of the ones I bought were shimmers; the era of the glitter topper seems to be over for now. I am planning to do a haul post from IEC, but right now, I have a group of SinfulColors glitters that's been patiently waiting for its moment in the Nail Wheel Wednesday spotlight while I've been gallivanting around two countries.